VIMOSTM is a silicon based technology built upon decades of semiconductor engineering. GaN is in its infancy. The devices are fragile with regards to ruggedness, require additional power supply complexity, and are cost prohibitive. VIMOSTM technology is specifically designed for pulsed, high power RF amplifiers. LDMOS, on the other hand, was designed for wireless base stations and only subsequently adopted for these types of applications. 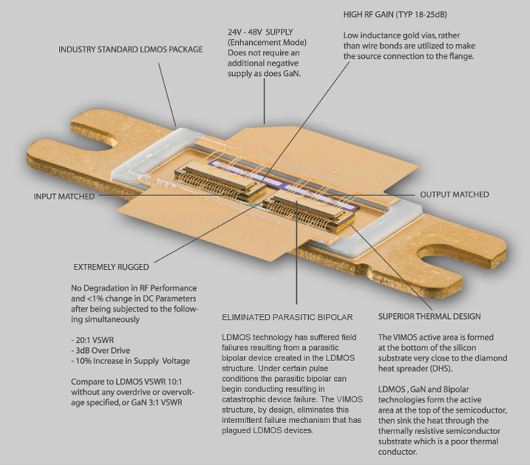 VIMOSTM devices use the same package as their LDMOS counterparts creating a more rugged amplifier and reducing dependency, exposure and risk to sole source LDMOS. VIMOSTM can improve the robustness of your amplifier, reduce field failures, significantly reducing the size and weight of your product and increasing performance, all at a competitive cost. It's 8:25 PM in South Australia.